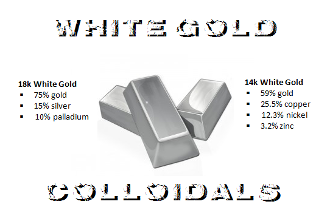 A common white gold formulation consists of 90 wt.% gold and 10 wt.% nickel.Copper can be added to increase malleability. The strength of gold–nickel–copper alloys is caused by formation of two phases, a gold-rich Au–Cu, and a nickel-rich Ni–Cu, and the resulting hardening of the material. Gold is an excellent all-purpose, high level gem amplifier and electrical conductor, especially on Solar plexus and Heart Chakra. It strengthens meridians, nerve system, digestion. Positively charged with warming sun energy. Often worn by teachers/healers, especially after much self-healing. Attracts prosperity, stores, amplifies thoughts/emotions/energy. Yang energy. White Gold: Combines sun and moon's energy, thus higher conductor and amplifier. It's a regenerator, helping one renew oneself and it works on the physical, mental, and spiritual planes. It benefits the nervous system and improves the ability of the nerves to transmit information in the most efficient manner. Helps with digestion and helps the body in the proper assimilation of food. Gold benefits the circulatory system and blood and helps control hormonal and chemical imbalances. It can be of great importance to individuals with degenerative diseases, such as heart disease or arthritis and also helps the brain work more efficiently.